JAMES W. FAY LAWYER Emmetsburg, Iowa November 2nd, 1938. 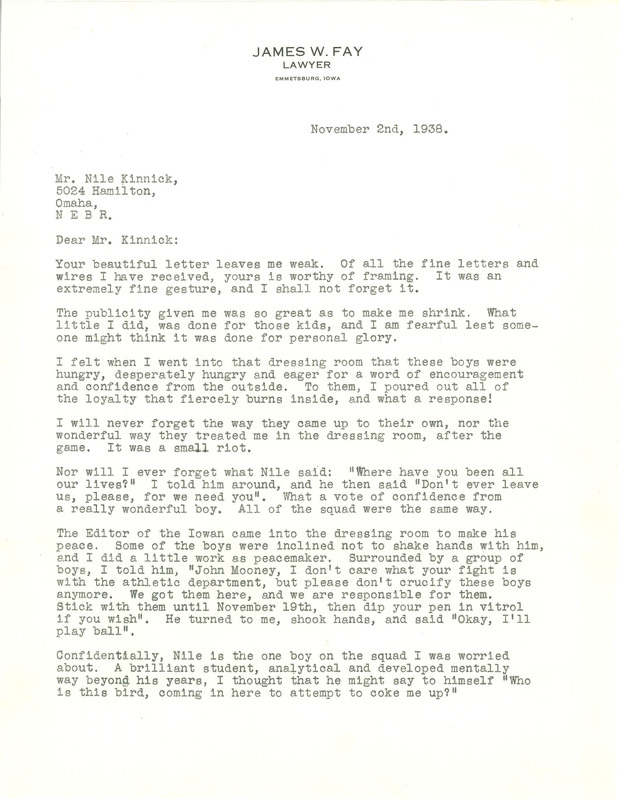 Mr. Nile Kinnick, 5024 Hamilton, Omaha, N E B R. Dear Mr. Kinnick: Your beautiful letter leaves me weak. Of all the fine letters and wires I have received, yours is worthy of framing. It was an extremely fine gesture, and I shall not forget it. The publicity given me was so great as to make me shrink. What little I did, was done for those kids, and I am fearful lest someone might think it was done for personal glory. I felt when I went into that dressing room that these boys were hungry, desperately hungry and eager for a word of encouragement and confidence from the outside. To them, I poured out all of the loyalty that fiercely burns inside, and what a response! I will never forget the way they came up to their own, nor the wonderful way they treated me in the dressing room, after the game. It was a small riot. Nor will I ever forget what Nile said: "Where have you been all our lives?" I told him around, and he then said "Don't ever leave us, please, for we need you". What a vote of confidence from a really wonderful boy. All of the squad were the same way. The Editor of the Iowan came into the dressing room to make his peace. Some of the boys were inclined not to shake hands with him, and I did a little work as peacemaker. Surrounded by a group of boys, I told him, "John Mooney, I don't care what your fight is with the athletic department, but please don't crucify these boys anymore. We got them here, and we are responsible for them. Stick with them until November 19th, then dip your pen in vitrol if you wish". He turned to me, shook hands, and said "Okay, I'll play ball". Confidentially, Nile is the one boy on the squad I was worried about. A brilliant student, analytical and developed mentally way beyond his years, I thought that he might say to himself "Who is this bird, coming in here to attempt to coke me up?"